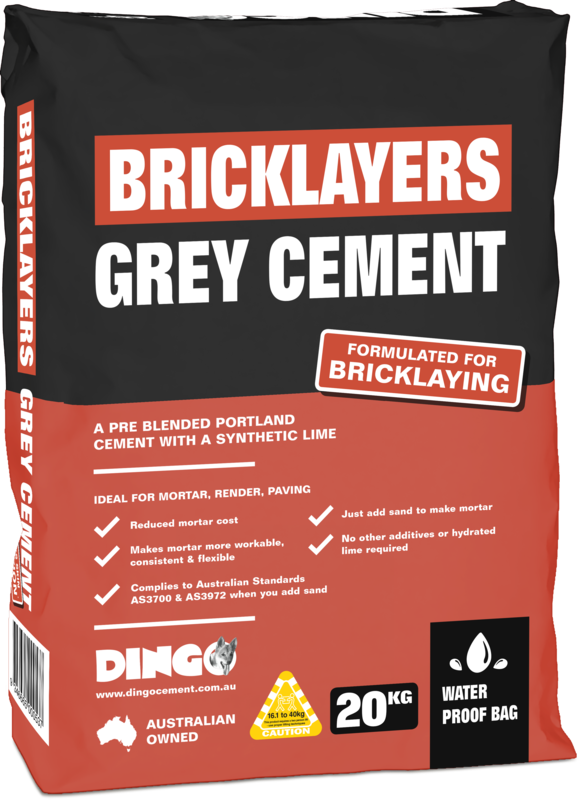 Offers superior workability for General Building applications, especially formulated for Bricklaying, Render and Paving mortars. Available in Water Proof Packaging. Careful not to over water. Bricklayers Grey Cement will self-lubricate the longer its left mixing in the cement mixer. Mix thoroughly to a workable consistency. Use a bucket to measure out your sand. Shovel batching is inaccurate. PARTS BY VOLUME: PER THE AS 3700 STANDARD. Depending on the sand used, you may want to slightly increase or decrease the water demand per 20kg of Bricklayers Grey Cement. Be careful not to over water. Bricklayers Grey Cement will self-lubricate the longer its left mixing in the cement mixer. Use a bucket to measure out your sand. A 10 litre water bucket holds approx. 15kg of sand. DO NOT USE Plasticizers or air entraining additives with Bricklayers Grey Cement. WARNING: Mortar plasticizers on/ or workability agent additives should not be added. This modified cement blend already contains synthetic lime & workability agents, Hydrated Lime can be added for extra workability.